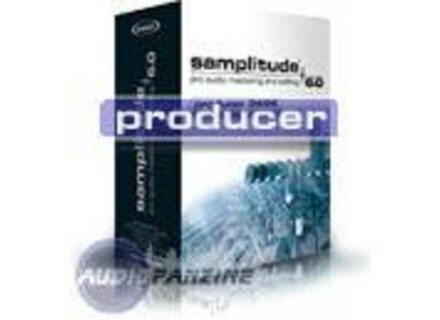 Samplitude 6 Producer, General Sequencer from Magix in the Samplitude series. Product replaced by the Magix Samplitude Pro X4. Install: no problem, recording either. samplitude configuration: the cake, cream and cherry to both this program. the manual is more than enough, but very long, with some translation errors. Samplitude 5 6 years, 2 years 6 version, version 8 once it is translated into French. What I like most is the ease of starting simple, the opportunity to progress by itself, the sound amazing, space-production mix, the strategy "object editor", everything. Cubase blah, blah blah cakewalk, cool edit Yeah but not really to edit and mix, logic audio I understood nothing. Excellent value for money, but I did not find the price you specify, but at € 230 (24/96 producer French version). My choice is to acquire the particular version 8, but includes statégie Magix? No promotion in France, no date of translation of the V.8, and perhaps "the rolls of computer music" as I read it several times, but everyone who cares, it it's true. When is a petition for Magix take us into account?